According to the state Department of Legislative Services, the gap between what was judged by the State to be required for the Baltimore City Public School System (BCPSS) to provide a quality education and what was actually funded – was $290 million in FY 2015. An independent analysis mandated by the General Assembly for that year found BCPSS deserved $358 million. Over time, Baltimore City students have been deprived of over $2 billion in constitutionally required funding. These numbers affect tens of thousands of children in Baltimore City schools, most of whom are Black and Brown and whose families live in poverty. Stefanie Croslin’s 13-year-old son, Cohen, loves science, but his school does not have Bunsen burners or an eye wash station, much less the advanced computer technology available in neighboring Baltimore County. Teachers, instead, have had to collect materials donated by parents to design experiments. Ms. Croslin worries what will happen if he never receives the learning necessary to succeed in college. Similarly, her younger son, 11-year-old Cyrus, was devastated when his school had to cancel music class. It was his favorite subject. Most parents of children in Baltimore City schools have stories like these. Angela Gant’s younger daughter, 14-year-old D’Nyah, used to excel in math, but she recently began to struggle. Ms. Gant wants to help her, but her school no longer offers the tutoring services that were available when her older daughter graduated. Deshawna Bryant has sickle cell anemia and spent a week in the hospital after a day in an unheated classroom last winter. These problems mirror those highlighted when the Bradford case was originally filed, almost a quarter of a century ago. The plaintiffs in Bradford v. Maryland State Board of Education, a case pending in the Circuit Court for Baltimore City, are a class of parents of students attending public schools in Baltimore City, represented by the American Civil Liberties Union (ACLU) of Maryland, the NAACP Legal Defense and Educational Fund (LDF), and BakerHostetler. In 1996, the Circuit Court in Bradford declared that students in Baltimore City were not receiving the “thorough and efficient” public school education to which they are entitled under Article VIII of the Maryland Constitution. In later rulings, the Court repeatedly found that the State was continuing to violate its constitutional duty to Baltimore City students, including providing insufficient funding for an adequate education, as judged by contemporary standards. Baltimore City’s school buildings are by far the oldest in the state. Over 80 percent of the system’s 158 schools are in “very poor” or “poor” condition. The well-documented problems include lack of drinkable water due to un-remediated lead in water pipes, ancient boiler systems, roofs in need a replacement, and deficient electrical and fire safety systems. 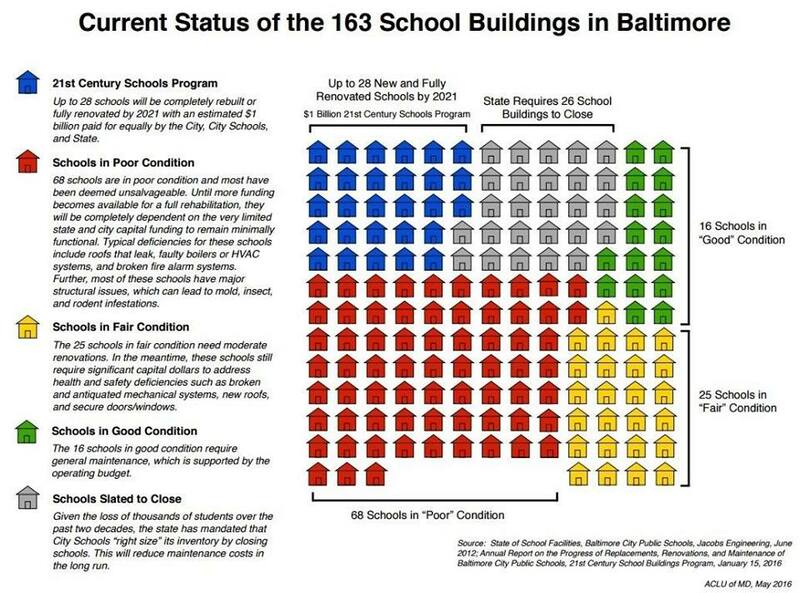 Baltimore lacks the resources that other jurisdictions of comparable size use to supplement their school maintenance and construction budgets. This means Baltimore must pay for many emergency repairs and renovations to facilities out of its operating budget, which unavoidably diverts dollars from instruction. In addition, many Baltimore schools also lack the range of specialized facilities necessary to meet contemporary educational standards, such as computer and STEM-related facilities and art, music, and after-school programs. Taken together, this drain on already meager funding resources exacerbates the constitutional “adequacy gap” in an area where a majority of the students are Black, Brown and from families with low-incomes. The ACLU has worked to ensure that the needs of students in Baltimore City – and other jurisdictions that have higher concentrations of poverty and majority Black and Brown student enrollments – are fully funded in the recommendations of the State’s Commission on Innovation and Excellence in Education, the “Kirwan” Commission. But the Kirwan Commission has repeatedly delayed its final report and the funding needs of students in Baltimore City seem unlikely to be fully addressed during the 2019 General Assembly.